Menehunes are the LVI Champions! Left to Right: #21 Pierre Recinto, #5 Jason Murashige, #25 Bryant So, #1 Tuni Perry, #3 Ryan Lee(Hall of Famer), #22 Reuben Medina (Tournament MVP), #44 Anthony Nocon (All-Tournament Team), and #15 Chris Hoe. 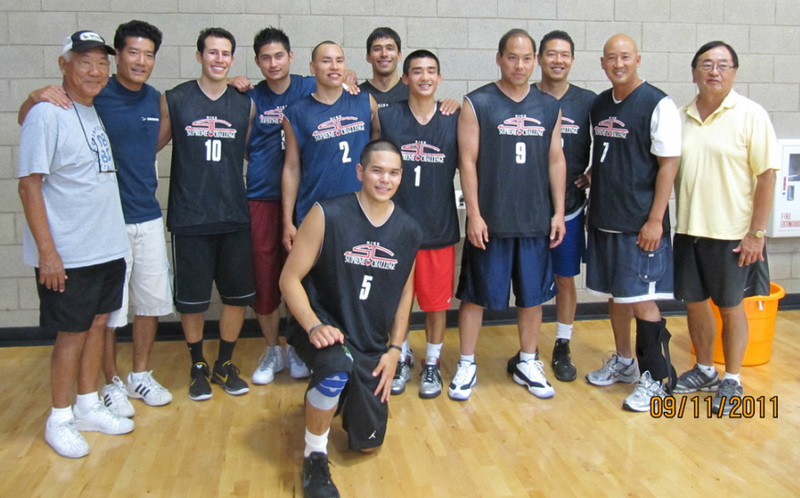 Menehunes win the LVI A+ Open Lower division Championships over Skyhook Treyz. What a debut for the Menehunes in there first LVI tournament appearance. The Menehunes will be bumped up a division next year and has there work cut out for them. It was an exciting effort for everyone. 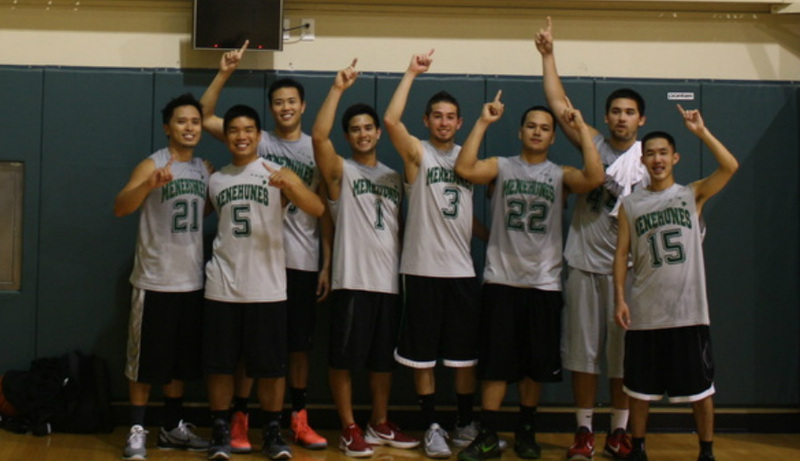 Menehunes defeat Skyhook for the championship! After 5 years of being on the waiting list, Menehunes somehow pulled some strings to get into this tournament, when teams been waiting 10+ years to get in. Menehunes will make there debut against Poi-Dogs in the 9:00pm game on the opening night. The Menehunes are coming in full force for this tournament and will have a chip on there shoulders after loosing in the Tigers tournament this past year. The Menehunes Roster will consist of California players as well as Hawaii imports for this tournament. Jimmy Miyasaka, Billy Hofman, and Jarrod Carroll will be playing for the Nakatani's this year again in the top division of LVI. Last year they lost in OT in the championship game to AZ-Desert Jade. Jimmy Miyasaka cramped up and had to go to the ER but hopefully he eats his WHEATIES for breakfast and doesnt die out on the court this year. Jarrod Carroll will be one of the main scorers for Nakatani's and Billy Hofman will run the show out there on the court. Come and support these Menehunes! After 5 years of bing on the waiting list the Menehunes FINALLY get into the LVI! The LVI is a prestigious Asian Basketball tournament in the country and has teams from all over the nation come to one city to play some good basketball! A few of the Menehune players been playing in it these last few years such as Billy Hofman, Jarrod Carroll, Bryant So, and Jimmy Miyasaka, who all played for Nakatani's in the AA Division. Billy Hofman and Jimmy Miyasaka both won a LVI AA-Silver Championship for Nakatani's back in 2009, and last year(2010) Jarrod Carroll, Bryant So, Billy Hofman, and Jimmy Miyasaka came in runners up in the LVI-AA-Gold (Top division), loosing to Arizona Desert Jade in overtime. This year the Menehunes look for revenge and also making a strong debut! The Menehunes will again be playing for Nakatani's in the AA-Gold division(Top Division): Jarrod Carroll, Billy Hofman, and Jimmy Miyasaka. The Menehunes will also be in the Men's A+-Open-Lower Division under the "Menehunes-LVI" name.